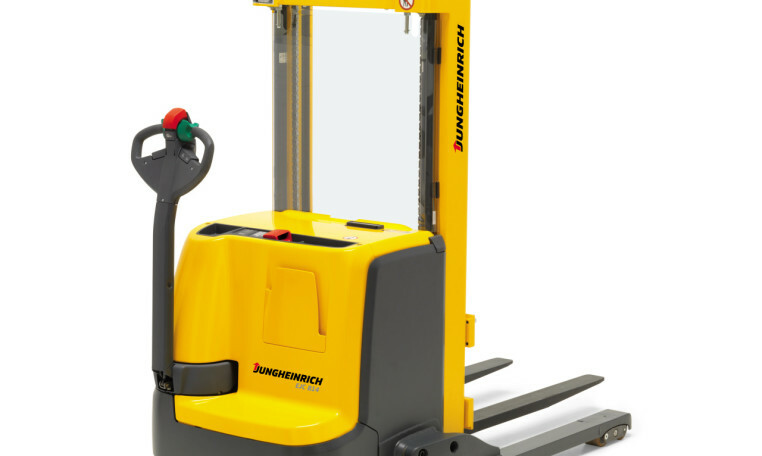 The Jungheinrich EJC B12/B14/B16/B20 pedestrian stackers are mainly designed for the flexible handling of special loads. With its straddled support arms and forged forks that can be lowered to the floor, the truck can lift loads by entering the load unit from below. 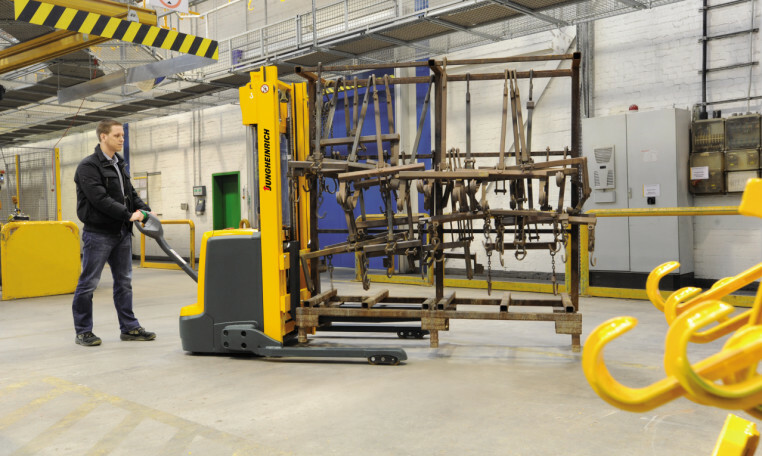 This enables parameter based pallets or transverse pallets, for instance, to be picked up in a similar way to a counterbalanced fork lift truck. The electronically controlled, powerful lift motor ensures smooth and quiet lifting and lowering of the load. This enables lift heights of up to 5350 mm (EJC B14) to be reached. From smooth depositing, rapid lifting and lowering or precisely approaching the racking – the operator has everything under control at all times. The support arms are available in different versions so they can be adjusted to different loads and pallet sizes. 4-point suspension and the widened solid steel support arms ensure excellent stability and high residual capacities. The low-mounted long tiller ensures that a large safety distance is maintained between the operator and truck. If space becomes tight, simply pressing the crawl speed button is sufficient to manoeuvre the EJC B with the tiller in an upright position. The side mounting of the tiller always provides unobstructed visibility towards the load. Electric tiller steering (optional for EJC B14/B16/B20) provides low steering forces and consequently fatigue-free steering, especially when driving with the tiller in a vertical position. The built-in charger (optional) ensures comfortable and reliable charging at any standard 13 Amp plug socket. 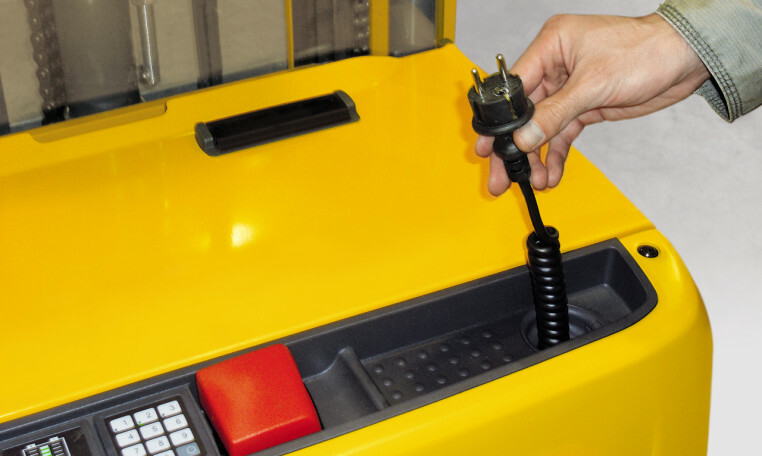 The quick-charging function (optional) guarantees charging within one shift (EJC B12). 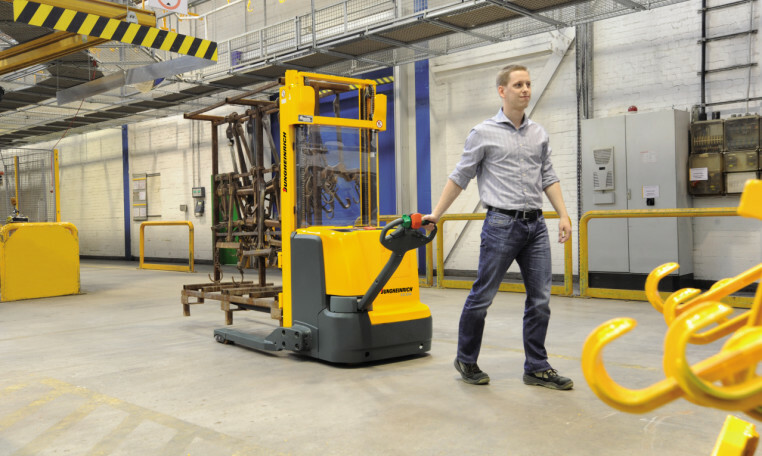 The EJC B12/B14/B16/B20 pedestrian stackers are mainly designed for the flexible handling of special loads. With its straddled support arms and forged forks that can be lowered to the floor, the truck can lift loads by entering the load unit from below. 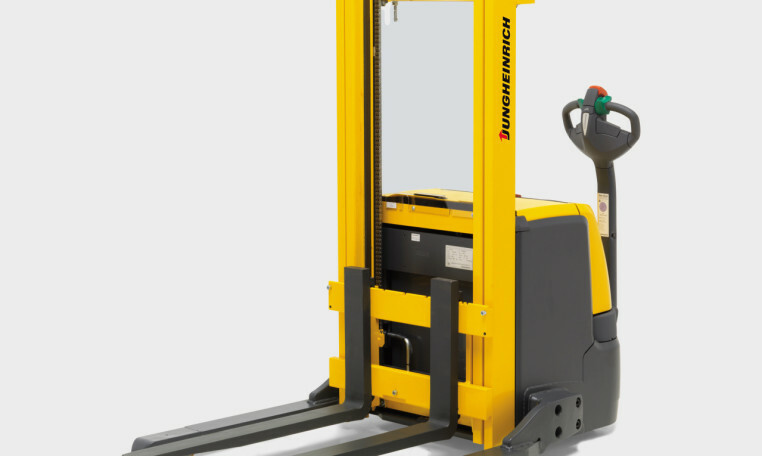 This enables parameter based pallets or transverse pallets, for instance, to be picked up in a similar way to a counterbalanced fork lift truck. High level of efficiency with excellent energy management. SpeedControl – roll-back protection on gradients. No carbon brushes – maintenance-free drive motor. 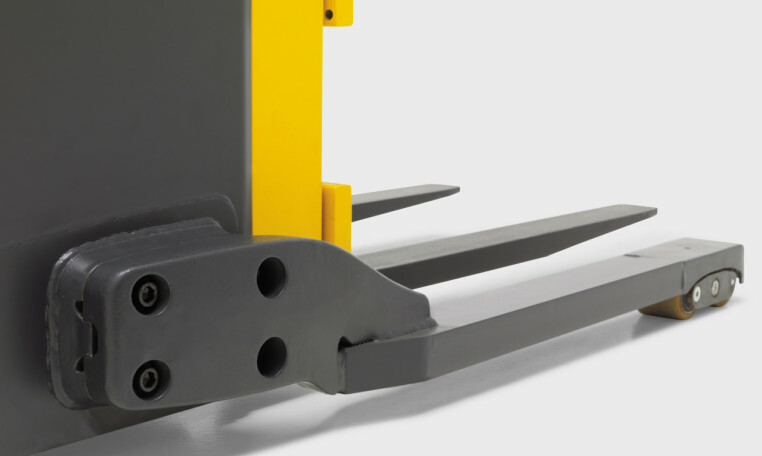 The EJC B12/B14/B16/B20 with an ISO fork carriage can be adapted in various ways, making it suitable for many applications/loads: From forged forks with different dimensions to the mounting of attachments with hydraulic functions (optional) for example. The operator remains safely within the truck contours during travel in drive direction. 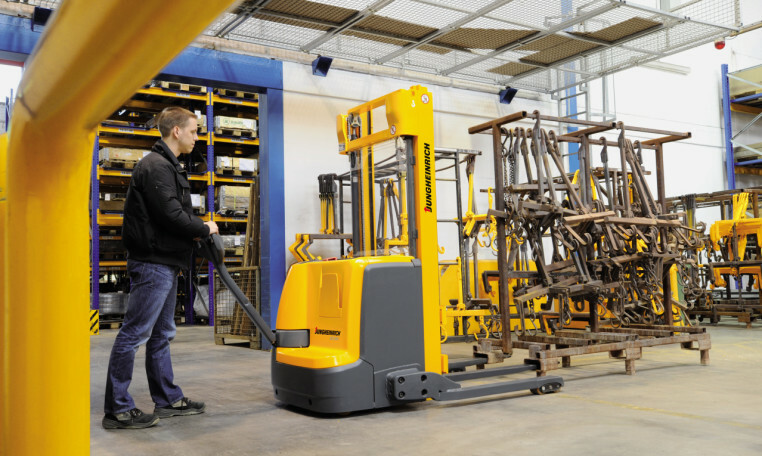 Precise, sensitive load handling through electronically controlled hydraulic motor. Gentle load depositing with proportional hydraulics. Automatic reduction of travel speed starting at a lift height of about 1.8 m.
Effortless steering is ensured by the long safety tiller which also maintains a safe distance between the operator and truck. Four-wheel concept for maximum stability. Electric tiller steering for fatigue-free steering in all applications (optional for EJC B14/B16/B20). Drive motor panel is easy to open with only two screws. Service access ports on the front apron. Simple and quick changing of load rollers with patented tandem load wheel rocker. Load rollers protected from above and frontal impact. Document holder on front cover. Battery compartment M: 3 PzS 225/300 Ah (EJC B12). Battery compartment L: 3 PzS 270/375 Ah (EJC B14/B16/B20). Built-in charger for easy charging at any standard 13 Amp mains socket (optional). Quick-charging function for charging within one shift (optional for EJC B12). Battery exchange is from above. Load guard available in different heights.